Free, easy to use audio recording tool. The audio file is saved on line and you access it, share it, use it with the URL code or convert to QR code that is readable with mobile devices. The limitations are that the recording time is limited to 30 seconds. It doesn’t provide embed code for the recording but the link is available. This recording could be added to their assignment and post the URL or QR code beside their work. New website I came across for adding voice to a photo. This can be used on a computer, iPhone, iPad, and Android phone. The account is FREE and it’s very user friendly. So, what is Fotobabble? According to their site, “its the easiest way to add voice to photos. Its free – just upload a photo, record your voice and share!” Audio recordings can be up to 60 seconds. Fotobabble could be used in your classroom to share information about field trips, projects, reflections about learning, and much more (see list below from their site with ideas)! The final picture with recording can be embedded on your blog, shared with friends, or posted to social media sites, like Facebook or Twitter. Easy, free, and great classroom tool to try out. Earlier this month, I wrote “10 Important Skills Students Need for the Future.” After reading a few articles about specific tech skills, I thought I write what I think are the 10 Important Tech Skills Students Need. 1. Internet Search – students need to know how to do a proper internet search, using search terms and modifiers. This skill is needed for school, work and life in general. 2. Office Suite Skills – students need to now how to create, edit, and modify documents, presentations, and spreadsheets. Businesses still use MS Office for the most part, but iWorks, OpenOffice / LibreOffice, and Google Docs are all getting more popular. They all work similarly so the learning curve when switching isn’t that big. 3. Self learning of tech and where to go for help – knowing how to search a help menu on software or hardware, where to go to find user forums for help, and where to find the manual for technology is a huge skill that many do not know about. 4. Typing – yes, typing. I can get much more work done since I know how to type, then people who don’t. It’s a skill that is necessary for any kind of writing. 5. Social Media – how to properly use social media for school and work, how to protect yourself on it, the issues of cyberbullying, connecting with others in your profession (PLN). 6. Netiquette – Internet/Email/Social Media etiquette – proper way to use the internet, write professional emails, use social media in relation to your job (not complaining about the boss). 7. Security and Safety – antivirus, spam, phishing, too much personal information sharing, stalkers, and more are all issues they need to know about. 8. Hardware basics and troubleshooting – knowing what different parts of technology are called, how to make minor fixes, and how to do basic troubleshooting for WiFi, networks, OS won’t load, etc. 9. Backup data – with all of the data that students create for school and work, it is important to back it up and have access to it at any time. 10. Finding apps and software – how to find, evaluate, and use apps for school and business. Also, how to find quality, free alternatives to paid software, apps and services. 11. Copyright and Citing Sources – students need to understand copyright laws and rules, how to cite a resource, and how to integrate someone else’s work into their’s properly. Click the provided links to see the day’s news summary or top stories. Use the provided tools at the bottom of the screen to pause, rewind, change volume, show/hide subtitles, and view full screen. For extended information, choose from the list of related topics at the bottom of the page. You will see the transcript of the report along with the included photos and videos. Click any photo or video to see the original source of the information. Want to suggest additional photos or videos, or find mispronunciations in the info? You and your students can use the provided form to let the folks at Qwiki know, and they’ll do their best to facilitate the changes. Click the “Improve this Qwiki” tab. Use the provided forms to suggest photos, videos, or provide feedback or corrections for the audio portion of the report. Open a magazine, a catalog, or take a look at sign in your local grocery market these days and you’re likely to see a QR code. To that end, Russel Tarr has developed the QR Treasure Hunt Generator. The QR Treasure Hunt Generator provides you with all of the things you need to get started creating your own QR codes and using them in your classroom. To use the QR Treasure Hunt Generator type out a series of questions and answers, generate the QR codes using the tool Russel Tarr provides, then print and display the codes around your classroom or school. This is a QR or Quick Response Code. Simply put, it is a 3D barcode read horizontally and vertically. Because QR Codes can contain up to 4000 characters of information you can put a ton of information in just one code. For example, it could be something as simple as a web address. QR codes are also beginning to appear on business cards because, again, they can contain lots more information. But by far their most popular use is for web addresses. Ads contained codes to sales information that didn’t appear in the ad or on the regular website. In a nutshell, you need a device that has a camera so you can scan or take a picture of the code, a program to do the decoding and web access to see where the code takes you. This is usually used with cell phones and ipads, but a web cam with software installed can read these as well. You will need a reader installed on your phone. There are lots to choose from and most are free. For the iPhone NeoReader seems to be the most popular. On Android the Barcode Scanner from Zxing is very popular. But NeoReader works on most Android phones as well. There are other apps too for non-smartphones. Just do a Google search for your phone and “qr code reader” and you should come up with something. One idea for use in the classroom that comes to mind is books. If you threw in a QR code on the front cover. The students can scan and read a book review written by a student from last year or even watch a video trailer of the book that a student created as part of a project. All of that information contained in a small black and white square on the cover of the book. Create a QR with the answers embedded right in the code and put it on the top of the next week’s homework assignment. 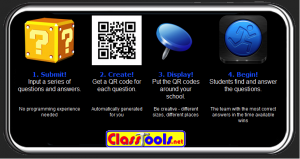 Create a QR code for each teacher outside their classroom for students and parents alike to scan the information. 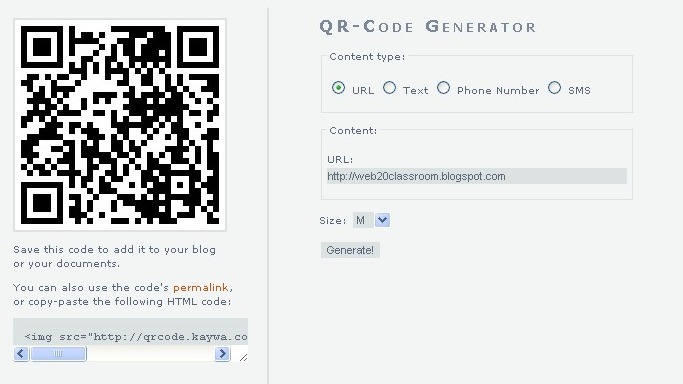 There are lots of different websites that will allow you to make QR codes. One of my favorite is from Kaywa. Just select the ‘text’ radio button and start typing. When you are finished, chose the size that you want and click ‘generate’. A QR code will appear on the screen. Right mouse click it, copy and paste into your document or embedded on website. It’s that easy. Or if you want just a website for the user to be directed to, it is very easy. 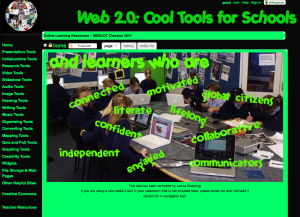 posted under Resources for Teaching, Web 2.0 | Comments Off on QR Uses–Treasure Hunt and more. 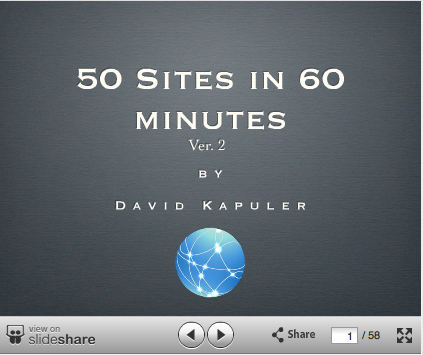 Education blogger David Kapuler has created a free slideshow of 50 great sites for education, creativity, organization and more. Each slide includes basic information about the site, a link to the site, and a link to Kapuler’s review of the site. Also has other slide shows on this SlideShare channel. All types of tools for students and teachers–research tools, slideshow tools, music tools, graphing tools. Excellent jumping off point for Web 2.0 tools. Another site that shows a lot of promise is a blog by the David Andrade, “Educational Technology Guy“. Videolicious is a free iPhone or iPad app for creating videos on the go. You can mix together images, video clips, music and your voice to create a short video. This could be a good device to use with your iPad to create short videos about all kinds of subjects in the classroom. Locations services on device have to be turned on to use the app which may be an issue. This is very similar to the services provided by Animoto.